Ladies of Sunnybrook Farm Pie Sale. Tuesday, April 9: 9:00am-6:00pm & Wednesday, April 10: 9:00am – 1:00pm in the Bower House. Home-made pies are only $12.00. Old Fashioned Ham Dinner. May 7, 8, 9: 2 sittings at 5:00 & 6:30pm. Join the Ladies of Sunnybrook Farm as they present their famous ham and scalloped potatoes dinner in the new Calder School building. Tickets are $15.00 and go on sale Monday, April 8 (Monday, April 1st to Members only). Sunnybrook Farm Museum Garage Sale. Join us on Friday, May 24 between Noon and 8:00pm for our multi-table garage sale. Donations of gently used items gratefully accepted anytime after May 1. No furniture or clothing please. Free Admission. Spring on the Farm. Saturday, May 25: 8:00am to 4:00pm. Join us for a special country breakfast, garage sale, face painting, family activities, and a chance to meet the baby animals that are going to live at the farm throughout the summer. Antique tractor pull, cookie walk, and other activities. Admission by donation (meal charges apply). Lunch at the Farm. Wednesday, June 26: 11:30am to 2:00pm. Relax in the Calder School community hall and enjoy lunch including home-made pie with ice-cream. Includes a guided wagon ride featuring the history of Sunnybrook Farm Museum. Cost: $12.00 per person. Reservations recommended. Lunch at the Farm. Wednesday, July 10 & 24: 11:30am to 2:00pm. Relax in the Calder School community hall and enjoy lunch including home-made pie with ice-cream. 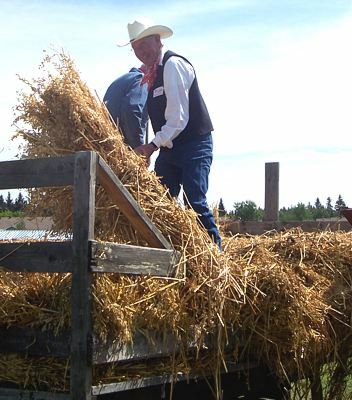 Includes a guided wagon ride featuring the history of Sunnybrook Farm Museum. Cost: $12.00 per person. Reservations recommended. Lunch at the Farm. Wednesday, August 7 & 28: 11:30am to 2:00pm. Relax in the Calder School community hall and enjoy lunch including home-made pie with ice-cream. Includes a guided wagon ride featuring the history of Sunnybrook Farm Museum. Cost: $12.00 per person. Reservations recommended. Pioneer Days Festival. Saturday, August 17–Sunday, August 18: 8:00am to 4:00pm. Pioneer breakfast, tractor pulls, tractor parade, threshing, cookie walk, home-made pie, silent auction, children activities, concession, face-painting and more. Cost is $15.00 per family or $5.00 per person (additional meal charges apply). Lunch at the Farm. Wednesday, September 11: 11:30am to 2:00pm. Relax in the Calder School community hall and enjoy lunch including home-made pie with ice-cream. Includes a guided wagon ride featuring the history of Sunnybrook Farm Museum. Cost: $12.00 per person. Reservations recommended. Fall Turkey Supper. October 1,2,3. Two sittings each night at 5:00 pm & 6:30 pm. Join the Ladies of Sunnybrook Farm as they present their delicious turkey supper with all the trimmings in the new Calder School building. Tickets are $20.00 and go on sale Monday, September 9th (September 2nd to Members only). Ladies of Sunnybrook Farm Pie & Tart Sale. Tuesday, November 26: 9:00am-6:00pm and Wednesday, November 27. 9:00am-1:00pm at the Bower House. Home-made pies are only $12.00. Tarts are $8.00 for a box of 8.